Boston percussionist, Aaron Trant, premiered my composition Variable Rates for snare drum at the Massachusetts PAS Day of Percussion in 2008. Since then he’s included the work in programs with the Firebird Ensemble and the BMOP Club series. On January 26th, he will bring the piece to the Stone Mountain Arts Center in Maine. The program also features Lisa Saffer (soprano), Rane Moore (clarinet), and Sarah Bob (piano) playing works by Schubert, Poulenc, Xenakis, Mozart, and Bach. In 2010, I performed in Matthew Barney’s KHU, a large scale site specific performance in various parts of Detroit, along with members of the Detroit Symphony, New Music Detroit, and faculty from the University of Michigan. The operatic performance is based upon the myths of Osiris and Isis as well as Norman Mailer’s novel Ancient Evenings. Footage from the KHU performance will appear in Barney’s newest film, River Of Fundament. 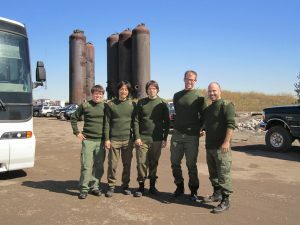 The film will premiere at the Brooklyn Academy of Music in February 2014 with subsequent showings in the UK and Australia. 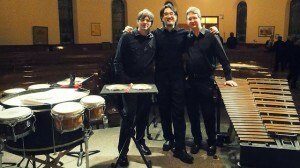 Percussionists on the KHU performance (L to R): Jacob Nissly, Ian Ding, Nick Papador, Joseph Gramley, and Jonathan Ovalle. Tamburo Doppio (Keith Aleo and Gerald Noble III) commissioned me to compose Karass. They will premiere the piece on January 18, 2014 at the Illinois Percussive Arts Society Day of Percussion. 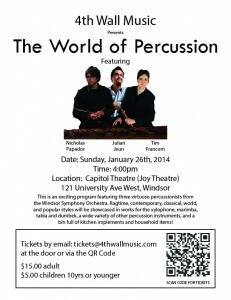 The Windsor Symphony Percussion Trio has a big concert coming up! Julian Jeun, Tim Francom and I are putting on a recital in a few weeks. Sunday, January 26, 4pm at the Capital Theatre in Windsor. This concert will be the first of the 4th Wall Chamber Series, an innovative, interactive, and informal way to experience world class chamber music. We’ll be playing works by Nebojsa Zivkovic, John Cage, Steve Reich, Ann Southam, Joe Tompkins, Bill Brennan, Nicholas Papador as well as some classic ragtime and world percussion music. I hope very much to see you there!